Courage was always very kind and gentle and a fan favorite for all our visitors, staff, and volunteers. Courage would lay quietly in the shade and we would cuddle with him and pet him. Even though his back reached well over 6 feet tall and his face was half the size of our bodies, we were never once scared of him or nervous around him. Courage was always a gentleman and a class act! We will carry him forever in our hearts! Courage was saved from a veal crate when he was eight weeks old. He was born to the dairy industry and taken away from his mom when he was born as they both cried for each other. He was put into a veal crate, kept alone, and fed an insufficient, anemic diet. With nothing to live for, he got very sick and eventually could not stand up. He was hauled to auction and the auctioneer called us to take him off their hands. Courage was sick with pneumonia and high fevers from months but with round the clock care he finally recovered. Once Courage was well, he would run around with the other calves we rescued and kick up his heals and play chase. He loves attention and would always follow us around for more attention. His eyes were lit up with new life, new hope, and he always had a smile on his face. Courage grew healthy and strong and ultimately ended up over 6 feet tall and 1500 pounds. Cows were originally small and agile, averaging about 500 pounds. With the industrial revolution and the creation of factory farms, people have taken the DNA of a “wild” cow and genetically engineered it to create a man made animal designed to get very big, very fast so they can be slaughtered when they are still babies. When they are saved and get to grow to age 5, they end up abnormally huge with small, fragile legs and huge bodies. Whereas a smaller cow can live to an average of 15 years, a huge genetically engineered cow will eventually not be able to walk because of the massive, man-made weight. 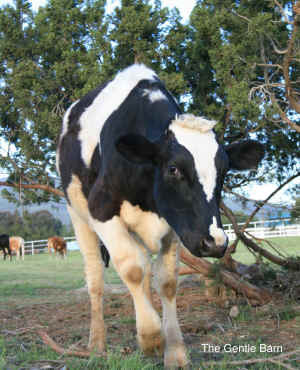 Courage was 6 years old when he developed cancer in his eye, common in Holstein cows, and had surgery to remove the growth. Courage spent the day lying down and when the drugs finally left his system he could not get up. We tried many things to get Courage to stand including renting an 800 pound forklift that we used to lift him with a harness. However, because of his massive size he was just not able to stand. After trying everything possible to get him to stand, and not wanting him to suffer, we had no choice but to say goodbye to our baby boy and help him out of a body that was set up to fail from day one. We were all devastated to see Courage go and we now have a huge empty hole in our barnyard. In Courage’s memory, we will continue to help people gently evolve to a plant based diet so beautiful boys like Courage won’t have to suffer. We strive to create a world where animals can stay with their mommies and drink the breast milk for themselves, instead of having it stolen for humans. We strive for a world where animals won’t be engineered to be slaughtered but rather get to live in their natural environments with their families and friends: free protected and respected!